Halotherapy is the replication of the microclimate of a salt mine, but designed to improve treatment times and efficacies. Halotherapy uses a more active delivery method by employing the use of Halogenerators. These devices take small amounts of pharmaceutical grade salt, Sodium Chloride; and grind it into fine particulates that are about the size of a red blood cell! These particulates are aerosolized into the room or “cave” to be breathed by clients in sessions lasting 45 minutes. The antimicrobial, antibacterial, and antifungal salt particles reach the deep cavities within the lungs, helping to break up mucus and toxins. Is there research to support salt therapy? Yes, most research has been done in Europe where the treatment originated. Pure “dry” sodium chloride is heated and ground up in a machine called a halogenerator. The micro-sized crushed salt particles are then dispersed into the air in an enclosed environment. These particles of fine salt penetrate deep within the respiratory system and work to remove mucous build up and eliminate bacteria and toxins. This unique process helps open and expand the constricted airways allowing individuals to breathe easier and more clearly. Dry Salt Therapy also provides amazing skin rejuvenating benefits when the epidermis is exposed during treatment. What are the benefits and conditions Halotherapy treats? Dry Salt Therapy has many positive effects on our respiratory, skin and immune systems. It reduces bronchial inflammation, thins and removes mucous from the lungs, as well as improves lung capacity and functionality. It also reduces skin inflammation, improves cellular rejuvenation and decreases itching and irritated skin conditions such as psoriasis and eczema. Dry Salt Therapy has also been very successful in reducing stress as well as enhancing our cardiovascular system. Not really. However, because Halotherapy has a detoxifying effect by releasing toxins and bacteria from the body, people who are taking certain medications might want to wait until they are done with the medication. Always check with your doctor before starting any Salt Therapy treatments if you are taking any medications for severe conditions. How many sessions/times a week is necessary? What is the treatment duration per session? 45 minutes for a Salt Cave session. Many people who have asthma, allergies and other bronchial issues have seen some amazing results in a short period of time. Breathing became easier; more energy was experienced and just an overall better quality of life. Now we don’t make any medical claims about Dry Salt Therapy but after receiving treatments people’s respiratory issues and lung function have vastly improved. In addition, those who have severe skin conditions such as psoriasis, eczema or acne have also had incredible improvements in the health of their skin. Salt rooms are methodically designed in such a way so that people can relax in a soothing and tranquil environment. It’s a place where one can sit back and experience the salt treatment in a very peaceful and non-stressful setting. People can read, listen to music or nap if they want to. Each Salt room is different and can have different themes and feels depending on the type of salt décor that is used. 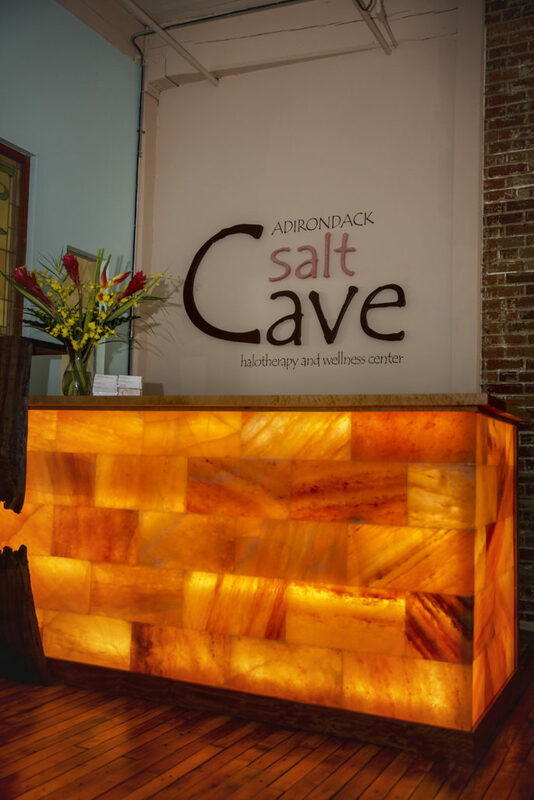 Each salt room has uniqueness about it but provides the same beneficial wellness treatment that only halotherapy can offer. Over 500 Million years in the making, Himalayan Salt was formed as primal seas dried up and shifting land masses gradually covered these salty accumulations. Over vast geological time, mountains formed; producing tremendous pressure on everything lying underneath. The resultant salt is now deeply mined from over 5,000 ft. deep within the Khewra Mountains. Salt by its very nature is anti-microbial, anti-bacterial and anti-fungal. The Dead Sea has an over 30% salinity level and thus cannot support life. That is why it is called “The Dead Sea”! No bacteria or microbes are able to exist due to the high salt level. What should I wear in the salt cave? Comfortable, casual clothing is fine. We ask visitors to refrain from wearing perfumes or fragrances as a courtesy to other visitors who may have an allergy or sensitivity. Is the cave safe for pregnant women? Salt therapy is perfectly safe for women at any stage of pregnancy. Because pregnancy can affect women in different ways, you’re invited to consult with your doctor if you have specific questions or concerns, but generally speaking, a visit to the cave is as safe as breathing the salt air by the beach. Yes our Suite & Salt Cave are Handicap accessible. The building has elevator access from the parking lot on the right side of the building. What is Sole (pronounced so-lay)? When added to pure water, to the point of a saturated solution, Himalayan salt creates Sole. Sole is another ancient remedy that is known to alkalize, hydrate, re-mineralize, purify, detoxify, and cleanses the blood and digestive tract. It can also be used for washing skin rashes, cleansing wounds, as a mouthwash and gargle, which can aid some clients with some of the unfortunate side effects associated with their disease. This low cost natural treatment can become part of an ongoing healthy lifestyle. ​The information provided is for informational purposes only and not intended as a substitute for the advice provided by your physician or other healthcare professional. Salt Therapy is not a substitute for medical treatment and diagnosis of any health condition. It is recommended that you seek medical advice relating to your health problems; do not neglect regular medical check-ups; do not change or stop taking your medication and treatment without consulting the physician. Patients with high blood pressure need doctor’s consent. Pregnant women need doctor’s consent. If you are suffering from any sort of illness, especially those which are transferable, we ask that you do not enter the center. In the event of a surprise illness we will be happy to refund or reschedule your session, even without 24 hour notice. Proudly serving Glens Falls, Queensbury, South Glens Falls, Saratoga Springs, Lake George, and the Adirondacks of Upstate New York. © 2017 Adirondack Salt Cave, LLC. Glens Falls Web Design by Advokate, LLC.